Detoxify your body as part of your Spring Cleaning! Spring draws us outdoors to sit and enjoy the warmer weather. Sip this healthy juice on your porch and drink up the nutrients and detox support your body is craving! Fruits are a natural partner for detoxifying our bodies. Most fruits are high in liquid-content, which helps the body wash out toxins. Citrus fruits help flush out these toxins and jump start our digestive tracts. 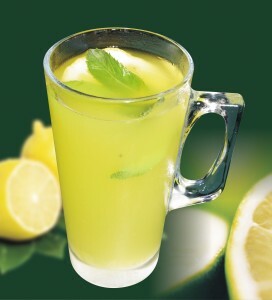 Lemon juice also supports the liver in its cleansing processes. A natural anti-inflammatory food, ginger promotes detoxification by speeding the movement of food through our intestines, thanks to the compounds gingerols and shogaols. 1. Combine the water and the juice of the half lemon. 2. Use a zester to finely grate the ginger into the drink. Optional: Pour over ice or add a few mint leaves. This drink is a wonderful way to support your body’s detox system first thing in the morning, but it’s a natural boost any time of day!